Check out the new system features currently live on the platform. You can also access a video review of the release here. 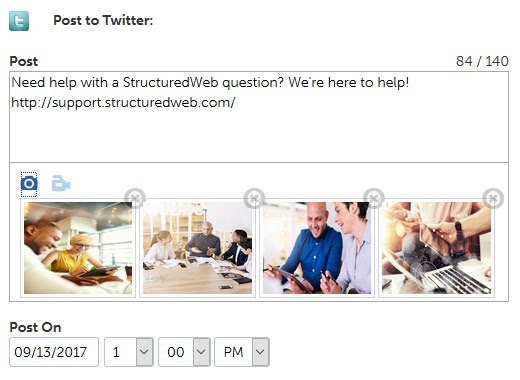 As social media has evolved, StructuredWeb has continued to advance and improve the social media functionality within the platform. Users now have the ability to upload images and video to Twitter campaigns. Additionally, the newly improved user interface is available for all social media platform campaigns. that will affect all social platforms campaigns. When creating Twitter posts, click the camera or camcorder icons to upload the image(s) or video that goes along with your social post. Then, set the date and time to schedule your post as normal. Your partners will be able to see the thumbnails of the images or video when they preview their social posts. To make content and campaign setup easier than ever, we’ve updated the user interface when adding tactics to a campaign. This update will greatly improve your ability to manage and updates the tactics with your campaigns to ensure that their settings are exactly correct. This also includes a new “Publish to Accounts” button that will share the tactics and campaign to your partners all at once. 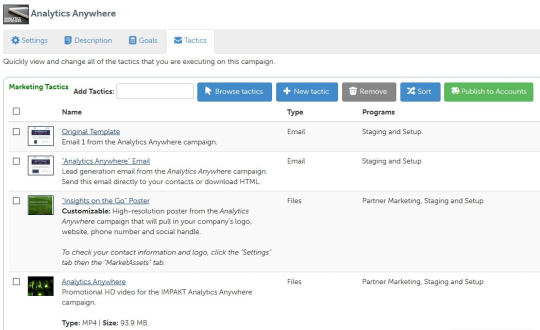 After adding the tactics to the campaign on the Tactics tab, click the “Publish to Accounts” button to select the programs that should have access to this campaign and the included tactics. You can also update the share and attribute settings of a selection of tactics simply by selecting those tactics and clicking the Settings button. 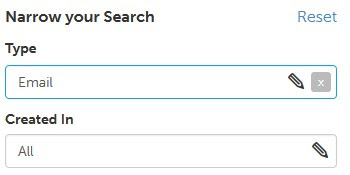 Users now have the ability to reset each individual filters within the “Campaigns” or “Library” tab, in addition to the ability to reset all filters at once. A follow up after any event is always courteous and can make a big difference between gaining and losing a customer. The system has added the ability to create post event emails after a WebEx event has concluded. Instead of following up with contacts outside of the platform, this feature allows you to create new post-event emails to contact your WebEx webinar attendees and no-shows. These post-event emails can be created before or after the event occurs and then sent out to the contacts based on their registration and attendance. To create a post event email for your WebEx event, go to to the Emails tab. Click “New Email” and then select either the “Post Event – Attended” or “Post Event – No Show” option to create the email. The mailing list for these emails will automatically populate following the end of the WebEx event. To learn more about webinars and webinar emails, click here. Users now have more time and flexibility to reset their password before entering the platform. Instead of password reset emails lasting 24 hours or less, customers have up to 48 hours with a password reset email to regain access to the platform.